I am forever on the hunt for quick and easy, nutritious and delicious family dinners. This chicken and cashew tray bake ticked all the boxes for me and was a winner after rugby training. I cooked rice in the rice cooker and had all the vegetables and chicken prepped before we left. If you’re after an easy weeknight dinner, then give this a try. In a medium saucepan over medium heat, whisk together soy sauce, hoisin sauce, vinegar, honey, sesame oil, garlic, ginger, cornflour and water until combined. Bring to a simmer, stirring frequently, until sauce thickens and bubbles. Remove from heat and set aside. Preheat oven to 200°C. Line a large sheet pan with baking paper or foil, spray with cooking spray and set aside. 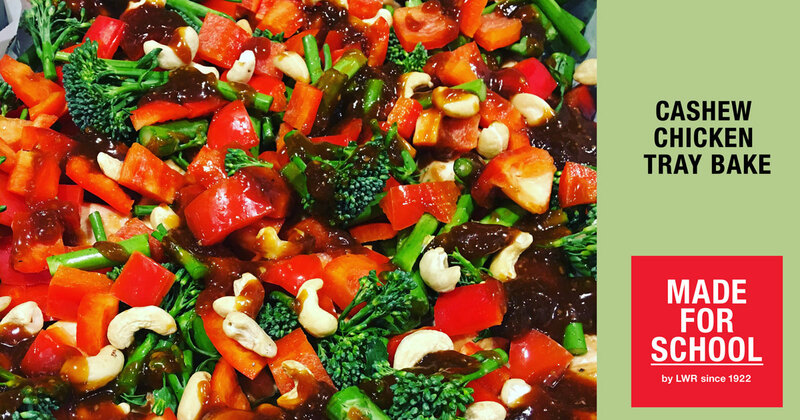 Arrange the broccoli florets, capsicum and cashews in a single layer around the chicken. Season the vegetables with salt and pepper and drizzle spoonfuls of the sauce and toss everything to coat. Return to the oven and cook for another 8-12 minutes, or until the chicken is cooked through and juices run clear. Remove pan from oven and drizzle with remaining sauce. Serve over rice or quinoa and garnish with shallots and sesame seeds, if you like.